Many people start their journey into sound electronics by building a simple synthesizer - the Atari Punk Console. This generates a square wave sound similar to Atari console games from the early 1980s. 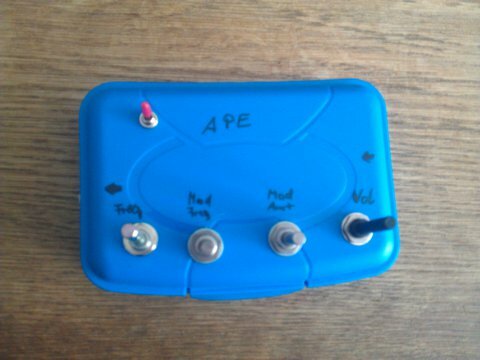 As this is a simple circuit, I decided to modify the layout to use it as a guitar effect. The electronic is quite simple. At first, an LM386 is used to amplifiy the incoming signal. 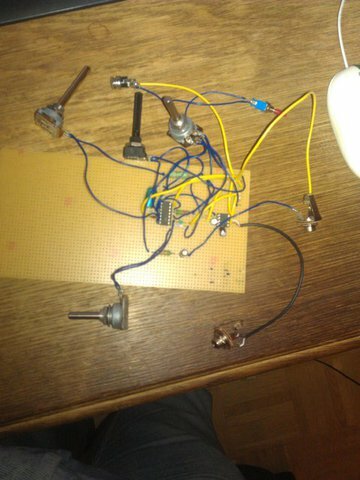 This is done according to the schematics in the datasheet, so that the signal with a maximum of 1V coming from a guitar is scaled to a maximum of 9V to use it for triggering the two timers in the NE556. Looking at the introduction to 555/556 timer, you can see, that the first timer is running in something similar to astable setup, while the second timer is running in a setup similar to monostable. 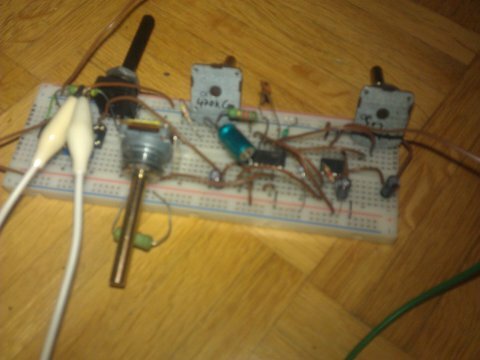 Both timer take the amplified signal from LM386 at the trigger input. Each time, the trigger input, e.g. 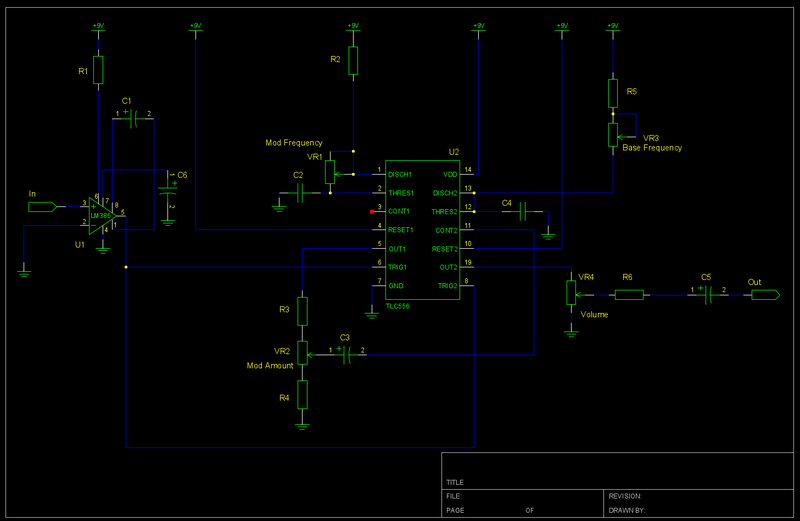 the amplified signal from LM386, exceeds 6V (2/3 of 9V), the output is set to high (9V), until capacitor C2 is discharged. The output is then set to low (0V). VR1 controls the length of the high signal until a high signal is set to low. The output from the first timer is fed into the control input with VR3 controlling the volume of the signal. This then sets the value to exceed from the trigger input to set the output to high. Each time, the guitar signal exceeds 2/3 of the control input, output is set to high, until the capacitor C4 is discharged. Output is then reset to low. VR3 changes the duration until a high signal is set to low. VR4 is used to control the volume of the effect, C5 is there to remove humming. Where do all these odd values for the resistors come from? Those are resistors that I had lying around, different values will work as well.